Niche it may be, but this classy and creative pedal exerts a strange allure to those yearning for something different. In the world of stompboxes, we’ve never had it so good in terms of sheer variety. Companies are going beyond the traditional to create pedals that produce sounds many would never consider to be part of the guitar’s sonic landscape: who’d have thought the sound of 80s gaming consoles could be a valid tonal component? 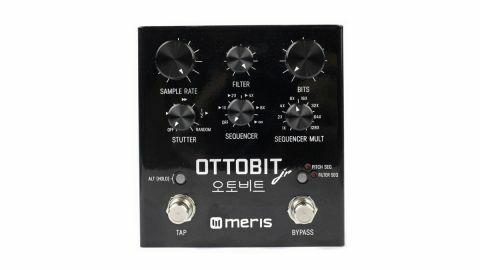 Well, Meris does - the US company has taken the essence of its Ottobit module for studio engineers/producers and put it into a dual-footswitch pedal. At the heart of the Ottobit Jr is bitcrushing to degrade your signal, but it has many other facets including stutter and sequencing effects. Any guitar player plugging into the Jr for the first time could easily be confounded by the outright cacophony that can emanate from this little box, but read the manual and a methodical approach to parameter setting comes up with the goods. The top three knobs basically alter the timbre - there’s adjustable bit rate, sample rate and a low-pass ladder filter. Fully clockwise, you get a normal guitar sound, but reducing the bit depth offers some fuzz sounds that you can tonally alter with the filter. By itself, reducing the sample rate adds a metallic flavour, from ring-mod-type sounds to rumbly noise. Careful combinations of all three knobs yield a wide range of altered tonalities, both relatively conventional and boundary-pushing. Taking things further, a six-step sequencer can be assigned to sequence either pitch, filter frequency or sample rate at a range of speeds set by the tap tempo. A value for each of the sequencer steps is assigned to the six knobs (accessed by holding down Alt). The myriad possible sounds are too numerous to describe, but if you’re familiar with bleepy arcade games or a synth’s onboard sequencer, arpeggiator or sample and hold functions, you’ll get the picture. On top of that, you have 22 on/off stutter effects that can be frozen as long as you hold down the tap tempo switch. For more live tweaking, an expression pedal can be set to morph between two complete sets of knob values. Such a range of possibilities cries out for presets; while there are none directly onboard, you can send and receive them using MIDI.